With their own affiliate partnership in place, Insider, Inc. (previously Business Insider) receives a small revenue percentage from readers who buy through their content. 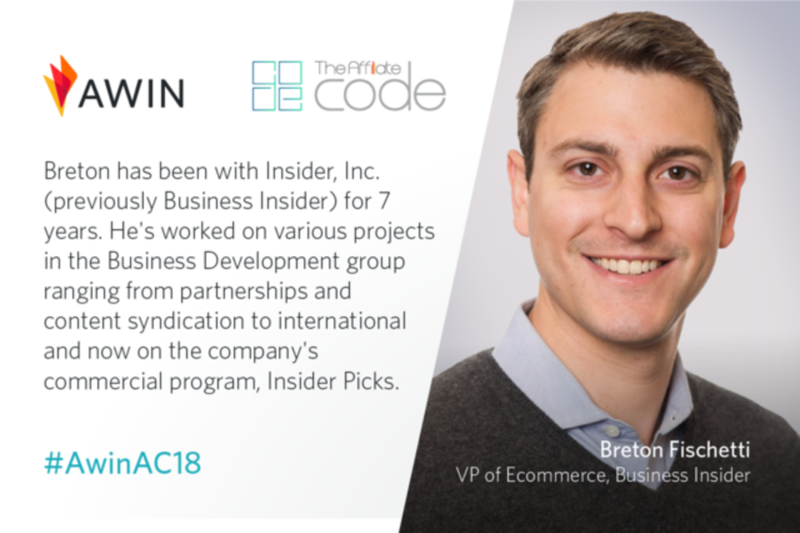 Breton Fischetti, has been with Insider, Inc. for seven years, most currently as VP of Ecommerce for Insider Picks. Breton will speak at Awin’s affiliate marketing conference, The Affiliate Code on June 14th (register here). His session, titled ‘The Future of Publishing’ will include the challenges and opportunities within the publishing industry. We catch up with Breton ahead of his talk to give a flavour of what guests can expect. Can you give readers insight into your background and expertise? I've been with Business Insider (now Insider, Inc.) for almost 7 years. In that time I've been fortunate to work on a lot of the projects that have turned the company into the successful business it is today, and also helped the media industry embrace and thrive in a digital world. Business Insider has been accredited by Axel Springer after stating that digital publishing is thriving following profit increases in 2017, what BI successes contributed to this performance growth? As a company we've always been forward looking, which has allowed us to experiment with new business models and iterate on them very quickly. INSIDER, one of our properties, was quick to embrace distributed social video. That was a key driver in our success, as was our eCommerce business, Insider Picks. We got into these spaces early and learned quickly, so that by the time other media companies got into the space, we had enough time to hone our strategy for success. How do you feel disruption is hitting the publishing industry within digitalisation and its future impact to the affiliate channel? I think the factors that will impact the affiliate channel are also big factors in the digital ecosystem's future evolution: Amazon, Google, Facebook. They're increasingly taking more and more shares of online activity, so being able to operate successfully will require us to fight for attention in a competitive landscape. With some social publishers having already shut down due to the Facebook News Feed algorithm changes, what is the future for digital publishers working across social platforms? It's uncertain, to be sure. But we've been able to adapt to changes by not necessarily going "all in" on any one platform. We want to be diverse so that if something changes, we can look to other partnerships or build new ones that will keep us growing. What are your concerns around the pressure for creating authentic and engaging content within the publishing industry over the next couple of years? A good story is a good story and always has been. We focus relentlessly on driving value for our readers. If we're not doing that, we won't succeed. It's the foundation of the company and doing that well is the main reason I have confidence that we'll be successful over the long run. We look forward to welcoming you to The Affiliate Code on 14thJune, what can those attending your session expect to hear more about and what will the audience be able to take away? I'm looking forward to being there with everyone at The Affiliate Code. I'll go into more detail about our affiliate channel, how it works and what's been successful for us. Register for The Affiliate Code here.